Brrr – the weather is fully winter here in Indiana. I’ve been working on an afghan for a loved one, and realized I don’t think I’ve posted anything about it. Meet Exquisite, the cover project from Leisure Arts Big Book of Quick Knit Afghans. I’ve made several afghans from this book, and enjoy it very much. The projects are fairly easy, beautiful in design, and the instructions are clear and easy to follow. 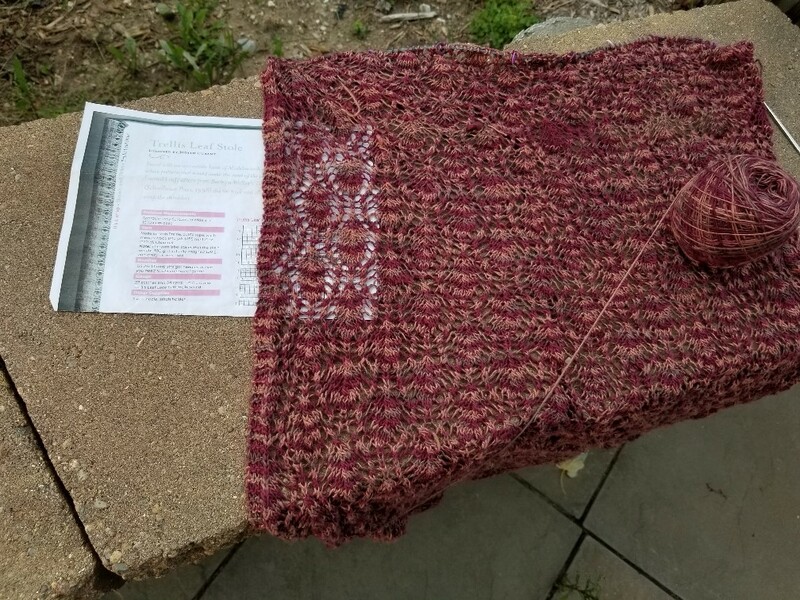 What makes the project “quick” is that every project is designed to knit with two strands at a time. 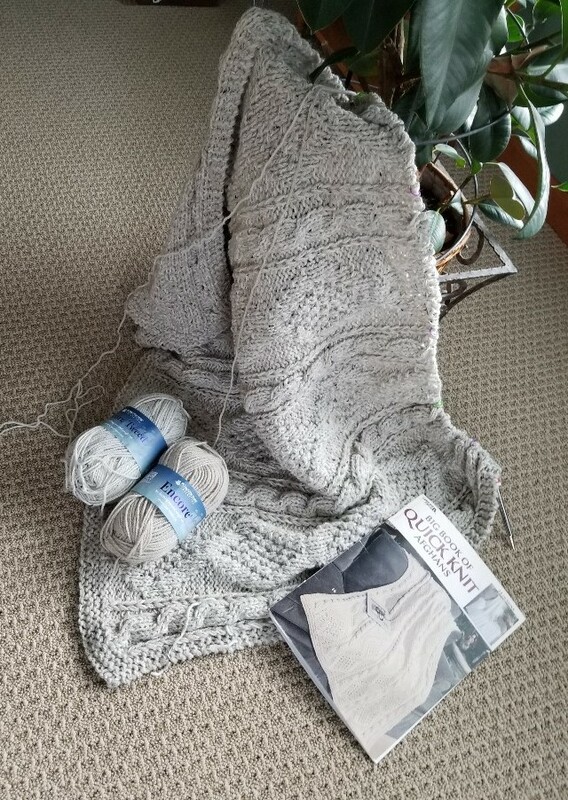 In this case, I’m mixing it up a bit (not that you can tell), by using one strand of Encore Tweed by Plymouth Yarn in color 1363 Oatmeal, and one strand Encore Worsted by Plymouth Yarn in color 0240 Taupe. In a way, this is a “stash-buster” project – Both yarns were originally purchased for projects that went other directions. I did not have enough of either for an entire afghan, but plenty if I use one of each, and the results are quite nice. I don’t think I’m half-way completed on this project, but it’s a good time of year to be working on afghans – keep warm and knit! 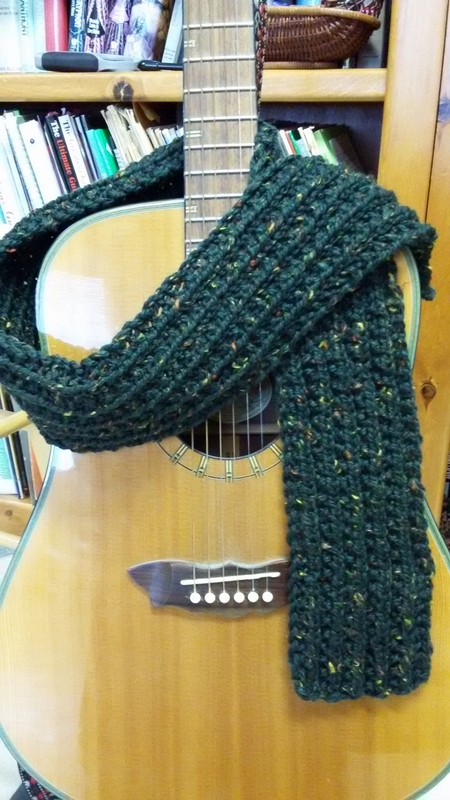 This is a beautiful wrap pattern from John Brinegar, available free on Ravelry. Pashimina is a generous and drapey wrap that will work well with many styles. The yarn is Artful Yarns Lustro in color 3903. The yarn is discontinued, and I purchased it years ago for a sweater, but never liked how it swatched up for that purpose, so it languished in my stash. The colors for this yarn are a three-ply of forest green and brown wrapped in a gold netting-style ply. I wasn’t happy with how it worked up for a sweater, but I think I’m going to like the wrap. This is Trellis Leaf Stole from the book Lace One-Skein Wonders book by Judith Durant (Editor) and one of the “One-Skein Wonders” books, of which I have several. The yarn is a single-ply, cotton, hand-dyed yarn I found at the Richmond, Indiana yarn store, Ply Fiber Arts. Unfortunately, I’ve mislaid the tag, so I can’t tell you about the artist. This is, technically, a one-skein project, though the yarn is 800+ yards. Ply Fiber Arts is located in downtown Richmond and is a terrific boutique-style yarn store. The website photo is representative of the bright, spacious shop, with plenty of lovely specialty and premium yarns. If you get over to Richmond, I recommend you stop for a visit. Richmond, Indiana, is also the southern-most point of the Cardinal Greenway, which is a biking path from Richmond to Marion. My friend B and I have enjoyed biking on that trail more than once (though we have never gone the full 60 miles from Richmond). While I’m enjoying this project (the size 2 needles are a nice switch from the size 10 needles for other projects), I’m not as fond of the yarn as I hoped. This is another example of yarn that looks better on the hank than it does knit up. It’s a lovely color but the stripes are too narrow and busy. I’m hoping that the finished project “blends” with whatever it’s worn with, and is not so distracting. This is why I keep telling myself to skip the novelty yarns – they usually don’t work up as well as I imagine (or, I am not imaginative enough to work them up properly – either could be true). Two novelty yarns – one scarf. These yarns have languished in my stash for a good while. The red is an “eyelash” style yarn that never had much body and looked like a mass of fuzzy yarn. No shape, no style. The black is a larger size (thickness) yarn, and almost “too thick” to work up nicely. It also is sparkly. I don’t recall (nor admit to) purchasing either. I was in the mood for something quick and easy and mindless – tax season is driving me crazy. As usual for me, I started it a few times before I managed something I liked. So, “whatever-it-is” yearn in red and black, on a Size 10.5″ needle, cast on 12 stitches and garter stitch until done, then bind off loosely. There you go. 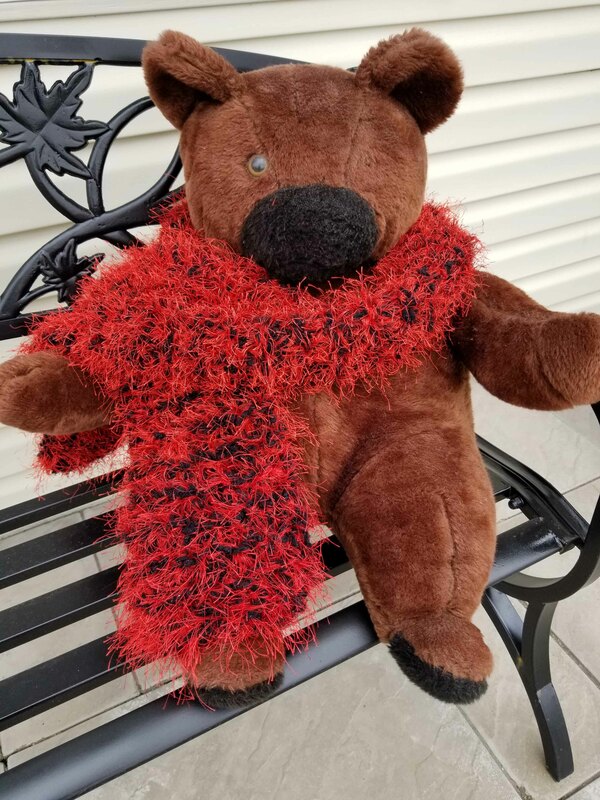 The scarf is longer than it looks – Moonbear has a very large neck. It would work very well as a scarf for a coat. The bear is “Moonbear,” which I made for my husband many “moons” ago, when we were first married. It still occupies a place in our bedroom. One of the eyes was a casualty of a child or dog along the way, but otherwise, it’s in pretty decent shape for being 30 years old. You can’t see the crescent moon on his chest because it is covered by the scarf. This yarn was pulled from my stash – one of the “on vacation” purchases. I think I purchased it when in Palm Springs several years ago – we took an outing to a nearby historic (and touristy) district and found “The Wool Lady” store tucked in a corner. I picked up a few hand-spun and hand-dyed hanks and never found the right project – until now. The yarn is Teeswater/Wensleydale by Feathergrass Fiber. Unfortunately, I could not find information about either the store or the fiber producer, so either may or may not still be in business. The pattern is Green the Whole Year ‘Round by Anna Yamamoto, available as a free Ravelry download. The yarn I used was a bit fuzzy, so tthe pattern in my finished project is not as distinct as the author’s pattern suggests, but I think it turned out nicely. The pattern was fun but challenging – the author rates it as “advanced” The pattern is both charted and written out, and the author provides clear directions, but one needs to be very comfortable with some of the more advanced stitches and the pattern requires attention. Changes: I did not include the “nubs” – I don’t particularly like that feature in most patterns, and I don’t miss it in the finished product. The pattern also calls for short rows for shaping – I used my favorite German Short Row technique, instead. Also note: I think the term is “severe blocking” and is required to make sure that the shawl is shaped properly. I was concerned about the yardage, but I had plenty, and wish I would have carried the pattern on for a bit more length. But, that sometimes happens with hand-made and dyed yarn, and having yarn leftover is better than not having enough. Note in the pictures that the yarn has more pink tones at the bottom (right side in the picture) of the shawl, and more evenly purple at the top – that is the difference in the two skeins used to make the shawl, and a cautionary tale in purchasing yarn by unknown fiber artists – even though clearly the same dye lot, purchase at the same time, and looked the same on the hanks, the dye process on the two hanks resulted in a clearly different product for each hank. Fortunately, the shawl pattern lent itself to this and the color change looks like it an intended feature. Had this been a sweater or some other more fitted project, it would have been a noticeable flaw in the construction. Finally completed! It took no fewer than four complete “do-overs” to get onto this pattern, but once it clicked, I completed it without too much difficulty. Needle size matters – use a larger needle size than recommended – you really want a loose knit on this project, both because of the type of project (a cowl needs a lot of give) and because of the double-knitting-like feel of the project. While you are only ever knitting with one color per row, the style is double-sided. Pay attention to stich count and transition between rows. Because you ar changing colors at each round, the transition needs to be smooth so it doesn’t look messy. This pattern could have been written more clearly. Instead of referring to the sample colors, the author would have made it easier to read by referring to MC (main color) and CC (contrast color). I never did get that straight, and – until I finally caught onto the pattern – it was confusing. Start with something simple. While I did swatches in the brioche knitting to figure out the technique, a two-color, in the round project was maybe not the best project to start with. I am pleased with the result, however. The Caron Simply Soft yarn is very soft, and the project is lofty and generous. I’m in an easy-project mood. My day job is getting busy (tax season), so I don’t want to have to think when I’m unwinding. Easy-to-memorize, quick-to-complete projects are on the docket for now. Easy Mistake Stitch Scarf is the pattern. The link is to a version posted on PearlSoho. I don’t think this is the version I made. I pulled the pattern either from Pinterest or Ravelry and kept it on my tablet, so I don’t have good history. Once I memorized the pattern, I didn’t refer to it. Yarn is Patons Chunky Shetland Tweed, in color Dark Forest Green. This is technically a “stash-buster” project, because I’ve had the yarn for a long time. I don’t think this color is available, though the product is still around. I’m fairly sure I purchased this at JoAnn’s Fabric and Crafts. Modeled by my Washburn guitar. Another hobby I enjoy and never have enough time to pursue.